A garden telescope makes a great centerpiece. The Porter Garden Telescope, by Telescopes of Vermont will add the crowning touch of luxury to your garden, patio or roof deck. Their beautiful garden telescopes can be used for stargazing or admiring views. 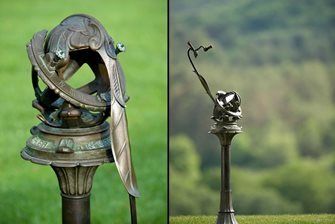 Originally designed in the 1920s, the reflecting telescope is a botanical Art Nouveau sculpture with superb modern optics. It comes with a bronze pedestal, and the entire unit can reside outdoors permanently. The patina can be either an antique verdigris or a warm brown. Waxing a few times a year will retain the delivered patina. The optics, which can be removed in seconds. They store in a handsome fitted case of leather and oak.